This is the journey of a new Yogi discovering that sky for the first time!! The underlying cue that permeates all my classes and workshops is to "stay". Stay with what arises from moment to moment. In Asana, stay with the sensations as they arise and as the body gives you feed back about how you're doing. Stay with the feeling of strength as it begins to degrade the longer you hold a posture. Stay with the fluidity of breath. And in the moments that you're beginning to notice that you've let presence slip, come back... and come back... and keep coming back. I feel that this Blog is a part of my practice. A way of communicating thoughts and feeling. A way of fostering conversation and community. This was the afternoon of afternoons. Brahmar Panam as a lead in to breakfast. the rays between the leaves. Rakta remedy... Chipati on the side. Brahmar Panam as a lead in to lunch. "There are dreams to be followed." "Sun is shining, weather is sweet." T-shirt, shorts, no shoes on my feet. Could we be in this together...? I was just thinking about the theme of my Tuesday night Vinyasa Flow 1 for next week. It seems these days that Yoga is pointing me into another cliched prediction of the stages of my own evolution... What I mean is... As most Yogis can probably relate... There are certain Spiritual milestones that happen in everyone's practice. Say, the first time you really experience your body in an Asana class. Or the first time while sitting in meditation, you actually re-connect to the Ground of All Being and for a moment there was no notion of space or time and only Presence. And then, the point when you begin to realize that what you're doing is not even really for you... but for everyone else around you. When I first became interested in Ayurveda and Yoga there was a self-consumed passion for them both. And even as I became a teacher, my earlier classes were more about me teaching AT my students rather than TO my students. My practice was harsh and contractile and all about perfecting Asana... Me, I, Mine!!! But now it's different. When I see someone walking down the road with a stuck hip and a resulting limp I just want to take them aside and help them reconnect with their ability to be healthy. Or now that I'm starting to recognize or theorize on peoples internal imbalances, I'm just giving all the info I have stored out for free... If what I have can help someone why would I withhold it? This above quote from Toronto based Ayurvedic Therapist and Yoga Teacher, Matthew Remski, holds so true for me in this moment. Ever since my first introduction to Ayurveda in my Yoga Teacher Training I felt a deep connection to its Philosophy and its Science. The idea that everything in this known world, from the Gotu Kola plant to treated Mercury holds the potential to impact the health of the body. There is a story of an ancient Ayurvedic sage, Jivakah. One day when he was teaching in Medical school he asked his students to go out into the environment around them and find something that had no medicinal value. After a few hours the students had all returned with their twig or their berry or sample of animal feces (I would guess that animal feces wouldn't have a lot of medicinal value but I don't really know). 3 or 4 hours the students waited but Jivakah had not yet returned. They waited until the end of the school day and still their guru had not shown up. The next day the students came back to the class room and yet still no Jivakah. Days past and the pupils were getting frustrated and angry with their teacher. Finally 4-5 days had past and finally Jivakah appeared, but he was empty handed. The students being angry asked him where he had been all this time and why was he wasting their time. Jivakah, demonstrating his understanding of Universal Knowledge and Life said, "I couldn't find anything, nothing that didn't have some influence on health. I looked at the rocks and realized that they contained minerals that could have an impact on our health. I looked at every weed and every plant. And as I stood and experienced those plants I realized that they too had something great to offer. I looked at every Mammal, every Reptile, every Insects and realized that no matter what I found had some impact on my state of being. I looked at the sun and the Moon and the Stars and knew that everything that I brought into my awareness somehow changed who I was and be metabolized into a new form of who I was. So I couldn't find anything that in some way or another didn't impact my health." I have found my calling and my direction. Ayurveda is the paradox of sophisticated complexity found in the midst of the simple rhythms of Life. And after being into Ayurveda for some time now, as Matthew Remski said, Ayurveda has now taken an interest in me. I recently had a personal assessment and plan developed with Matthew and it was amazing. I found out that I'm not the constitution that I thought I was. Which makes sense since the patterns that I was trying to implement into my lifestyle weren't really working out for me. Since putting this new plan into action I'm feeling more vital than ever. Ayurveda really is a powerful science of life. I have thus decided that I will pursue my Ayurvedic studies more formally with Matthew. He has his own Ayurvedic School in Toronto. I am extremely excited for this time in my journey. I am married to loving and support woman, I am finally discovering my Dharma and my place in this world. I am here to learn and to teach and share my knowledge and wisdom that I receive with all of those around me. I feel the true gift of knowledge is the ability to share it. May the Spirit indeed protect us both. May the Spirit indeed nourish us both. May we together rise up through study and understanding. May we not disrespect each other. I will be the first person to admit that sometimes I try way too hard. When I was in High School I tried ridiculously hard to get people to like me. In relationships, I was eager to please and I think that me trying too hard to be the perfect boyfriend was really the death of those relationships. When I started getting into fitness and body building I tried way too hard to get big arms and a ripped six pack and I would consistently push through major injuries thinking that more effort was the answer. I remember that the bane of my existence, while weight training, was my small Calves. I tried everything under the sun to get them to grow, with little success. When I started practicing Yoga, I would push and strive beyond my edge to achieve the "Perfect" postures. And although my practice looked aesthetically beautiful I was simply a ball of effort and tension.The result of so much effort?? Injury, discomfort, frustration and disdain for my physical body. And when I got injured I would use my old Body Building mentality of "Push through Pain". When I was in Teacher Training, I learned a very valuable lesson. "Don't try so hard...." and in this practice of Yoga "Less is much more." I have been following the teachings of a Calgary Yogini named Susi Hately for a while now. Her blend of Anatomy, Bio-mechanics, Movement Science and Yogic Philosophy really speak to me. Mostly because I am definitely a self proclaimed Anatomy Geek, but secondly because her teachings are about "Getting out pain" and finding a sense of ease in the body and mind. At this point in my practice, I am feeling a lot of discomfort and pain in my body. I have an annoying shoulder injury, consistent neck pain and some ongoing knee issues. Within the last year or so the reality of practice is becoming quite clear. Is more effort really the answer to my problem?? The progression of my Yoga and Meditation practice are now much more based in the realm of Exploration and Ease. And even though I am primarily a Vinyasa Yoga teacher I am doing no Vinyasas on my mat and am staying away from a lot of classic poses like Adho Mukha Svanasana because I feel that this and some other poses keep reinforcing the pain and discomfort that my body is trying to move away from. It just seems counter intuitive. My biggest realization is something that I've heard other Yogis say a million times.... Yoga is not about the poses!! I always find myself quoting Sarah Powers in class. She says "We don't use our bodies to get into these poses. We use these poses to get into our bodies." This really resonates with me. I have come to terms with the fact that my body doesn't enjoy or benefit from the practice that I was used to doing. I am learning to modify, to simplify and to adapt my Asana practice based on what I think my body is asking for. And the biggest concept that I'm wrapping my "No Pain No Gain" mindset around is that practicing in pain is just re-enforcing more pain and not healing or ease. Even my meditation practice is much more exploratory. I am much less concerned with the final goal, as I used to be. I am curious about the process. When I step onto my mat, it's no longer about, "How many calories am I burning?" or "How does my Chaturanga look?" My practice has become about unraveling the tension in my body and mind. It's evolved into, "How can I develop a functional body and mind?" or "How does my Chatruanga feel?" It's become about being healthy. 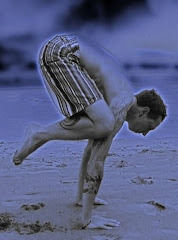 About finding "True" strength, flexibility and balance while staying out of pain. It's become about re-enforcing healing, compassion and rediscovering my bodies intuitive wisdom. I have also recently married to my soul mate Adele. This philosophy of ease, fluidity and exploration, I think, are 3 major components to a successful marriage. 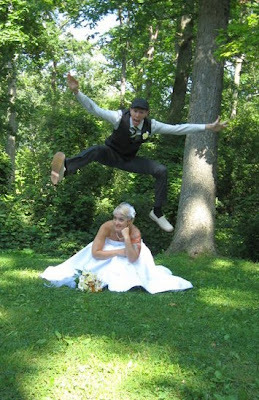 I love married life!! If anyone is actually reading this, I can't stress enough that this life and practices of Yoga and Meditation are not about the superficial qualities that most of us associate with them. It's not about grasping at the "Perfect Pose" or "Achieving Enlightenment" or "Living the Perfect Life". It's about going with the flow... about reconnecting with your innate sense of wisdom... It's about having fun, breathing, exploring, being open and loving. These are the keys to finding Ease in this lifetime and in the next! This post is dedicated to my beautiful wife and to this journey of love and exploration that we are both on together. As we move through this life, we have choices that need to be made. To most, this seems like such an obvious thing to say. The more I attune into this life that I have the absolute honour to be a part of, I notice that people do make decisions on a daily basis... Latte or Cappuccino, paper or plastic, chicken or fish (or Tofu), so on and so on. But there is a more pressing decision to be made. To be Present or not. And I'm slightly saddened to say that a lot of people choose the "not' option. My friend Beth Rutty (Anusara Inspired teacher), posted a fantastic question on her Facebook yesterday, "What does it mean to be Human?" And it was actually her 17 year old son that posed the question to her. This really got me thinking......hmmmm. And this is one of those questions that links back to decision making. In our lifetime, we don't only define what it is, to ourselves, to be Human, but we make the decision whether or not to even contemplate this question in the forefront of our conscious mind or just let it reside in the back of our heads and pretend like it's not important. To me (and I'm still contemplating this one), to be Human is to take responsibility for the Consciousness that we're given. We are the only beings on this planet that have been given the awareness and knowledge of our own existence and mortality. We have free will. We have the freedom to choose our own path in life. So I believe that we have the duty to use this free will with care and sensitivity. We need to keep others and our own "Best" interests in mind when we make the decisions that we do. For me, this is where the Yamas and the Niyamas come into practice. I think to be truly Human, we stay aware of our own uniqueness but at the same time we need to remember that we are all creatures of Nature. We are, as Michael Franti put it, "The One Earth Sons and One Earth Daughters of the One Earth Mama and the One Earth Papa!" We need to seriously take a look at what's happening in the microcosm of our own bodies and minds and immediate communities but also stay sensitive and in tune with the Macrocosm of this Universe that we are all a part of. After the Anusara workshop with Martin Kirk and learning more about Tantric Yoga philosophy, I've adopted a little bit of a new personal philosophy. Martin equated life to a rain puddle. Where some other schools of philosophy would ask you to step out of this life through renunciation, Tantric philosophy asks you to step into this rain puddle of life. And sometimes the rain puddle is going to get messy and sometimes it is clear, clean and shimmering. The decision that needs to be made is, will you stay in and open to what the puddle has to offer... Every experience. Been a while folks... I miss this in my heart as always... which is really what keeps bringing me back. I've always been one to write. In grade school I would write stories that the average expressive 8 year old boy would write. You know, the craziest little story about space and monsters with those funny little grade 3 animations... Arms too big, one leg longer, one eye bigger... If that was what I thought I looked like back then, I've definitely gotten better and more proportioned with age. In high school I really got deep into music, beat poets and really good lyricists. And even today, the first two things that I listen for in a good band are drums and vocals. You can never beat someone with a great voice, a moving message and a phat beat to back them up. I still have most of my poetry, lyrics and random ravings in a shoe box in my closet. I'm not sure if I've ever mentioned my interest in Anusara Yoga?.?.?.? I discovered Anusara Yoga very accidentally. I don't even really know how it happened but one day I found my self reading an article about John Friend. The article was very interesting... He talked about finding alignment in poses and these "Loop Thingies" as Martin Kirk says, to help re-establish your optimal physical posture. This interests me because I'm ridiculously drawn to the workings of our physical bodies... I too am a self proclaimed anatomy geek. Ever since I read that article I was intrigued by Anusara. 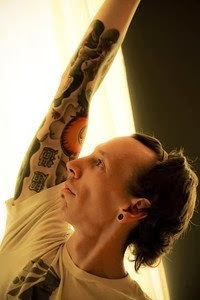 More recently I went to a workshop being held by an Anusara teacher from Toronto, Michael Siddall. I'd been reading more and more about Anusara on their website and in Yoga Journal, doing some videos from The Grand Gathering and this was the perfect opportunity to get some hands on experience in this practice. The workshop was amazing!! It was everything that I was looking for. The spirituality (Opening to grace), the physical alignment, all the very subtle aspects of Anusara. Since then, I've also taken a few Anusara classes locally. But the most profound experience, so far, was going to the Toronto Yoga Conference and taking a 6 hour workshop with Anusara Certified teacher and also self proclaimed anatomy geek, Martin Kirk. The workshop covered what is known as the 5 Principal Alignments and Tantric philosophy. And it was an eye opener. From that point I became much more interested about myself, my surroundings and how I interact with everything or sometimes withdraw from everything. This weekend I will again study with Michael Siddall and it intends to be very fun!!! My other reason for needing to blog today, was actually inspired by an Episode of Rachael Ray (the talk show not the cooking show). While flipping through channels I caught a glimpse of one of my personal hero's, Michael J. Fox. I love to hear Michael J Fox speak. The man has been through so much adversity with Parkinson's and even being thrust into the lime light at such an early age. And when you hear him talk he's so humbled by his experiences and blessed to be here and experience his life for what it is. I saw him on The Hour with George Stromboulopolus and he was truly up lifting. He was talking about how getting Parkinson's was one of the best things that had ever happened to him. At first listen, when you hear someone say that getting a debilitating disease was the best thing that had ever happened to him, it makes you raise your eyebrows and open your mouth a little. He then went on to explain how the disease has forced him to slowdown. Physically, every move he makes has to be more planned, calculated and mindful. It's made him really step back and learn to appreciate everything that he has (family, friends the disability but also the ability). He said that if everyone were just to experience life from his perspective the world would be much more in touch with where it is and where it needs to be. I like to think sometimes that I can inspire my students as much as my teachers and my hero's have inspired me. That I can use my own experience to help guide someone else on this journey. I do my best to learn from my mistakes, to be a positive person in times of adversity and share everything that I can. And to not judge myself in the times when I'm not any of those things. PS. 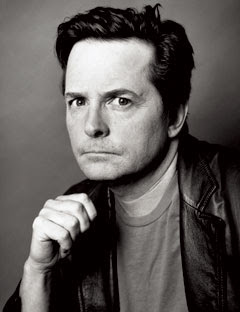 Michael J Fox you are a true Yogi! !